Do you like Scooby-Doo? Sure, you do. Why else would you be here? The franchise has pretty much set the standard for solving mysteries with a healthy dose of Saturday morning hijinks. However, DC Comics has no shortage of the same kind of properties – light-hearted heroes with more than a touch of silliness to them. So it’s inevitable that Mystery Inc. would eventually meet up with some of the forgotten stars of the Silver Age. During the broadcast of the Louie Jervis charity telethon, the Scoobies are drawn to investigate reports of a monster backstage. But they’re not the only interested parties. They are soon joined by Angel & the Ape, a detective team comprised of a young blonde and a clothed simian who also happens to be a part-time cartoonist. Joining them is the team known as the Inferior Five – five super-heroes who are everything the Justice League is not: clumsy, slow and cowardly. And coincidentally, Bunny of the Inferior Five is half-sister to Angel O’Day. Both teams we featured in short-lived series during the late 1960s. The Inferior Five ran in 10 issues beginning in 1967, with Angel & the Ape debuting the following year, running for six issues. During this same time, Stanley & His Monster was a regular feature of Fox and the Crow, until taking over the title in 1969. But what does that have to with the Scoobie’s current mystery? Maybe you can guess. 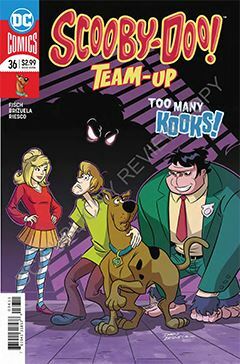 What I enjoy most about Scooby-Doo Team-Up is that it seems to allow the creative team to draw from just about anywhere in the 80+ years of DC Comics history. For an old-time comic book reader like myself, it’s a joy to see these obscure characters be resurrected, if only for a single issue. But who knows? Maybe a writer or editor will manage to reinvigorate them for the current audience.